Iris Leung works as a press officer for MSF in Hong-Kong. 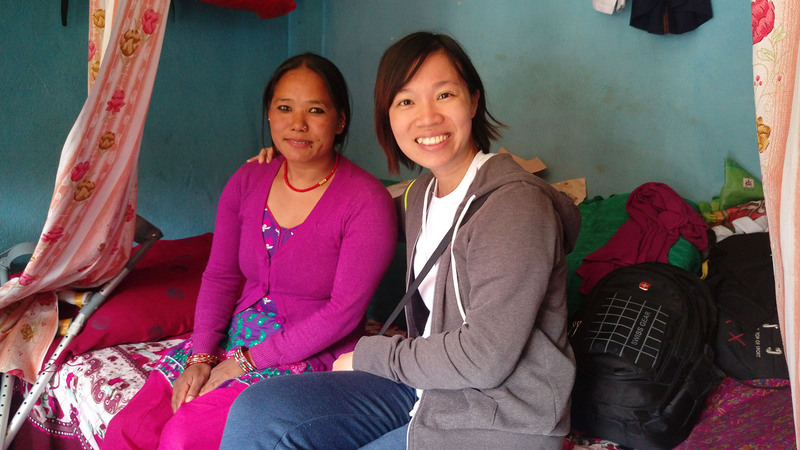 She recently visited Nepal where she met Biraj in the Spinal Injury Rehabilitation Centre in Sanga where MSF has been working for six months to provide rehabilitation to patients mostly injured in the earthquakes. What should a 19-year-old be doing with his life? He should be hanging around with friends, enjoying campus life, equipping himself with knowledge and experience, ambitious about his future and ready to pursue his dreams. This is what Biraj’s life had been meant to be, until the earthquakes turned his world upside down. I first met Biraj in the compound of the Spinal Injury Rehabilitation Centre (SIRC) in Sanga, which is an hour’s drive from Kathmandu. From the entrance there was a downslope leading to the three tents set up by MSF, where we provided rehabilitation services to victims with spinal or limb injuries. When I saw Biraj, he was in his wheelchair, striving to climb to the top of the slope and then race down as if it was a roller coaster. He repeated several times – it was a three-wheeled manual wheelchair, which means he was using his strong biceps to push himself up the gradient. As he sped towards the tents, he suddenly braked and pulled the front and side of wheelchair up, leaving only one of the back wheels as support. He swiftly moved his arms to roll himself around, ending the performance with a beautiful landing. “You are really good at moving around in wheelchair!” I said, as I was truly impressed by what he did. He didn’t reply but looked at me, emotionless and straight-faced, then moved quickly back to his tent. I couldn’t tell if he was shy, sad, or simply indifferent to what’s going on around him, until I heard his story from Najma, his counselor from MSF. When the earthquake struck the place he was staying in Kathmandu, he tried to escape from his room but got hit by a collapsing wall. His spinal cord was severely injured, and he was made paraplegic. 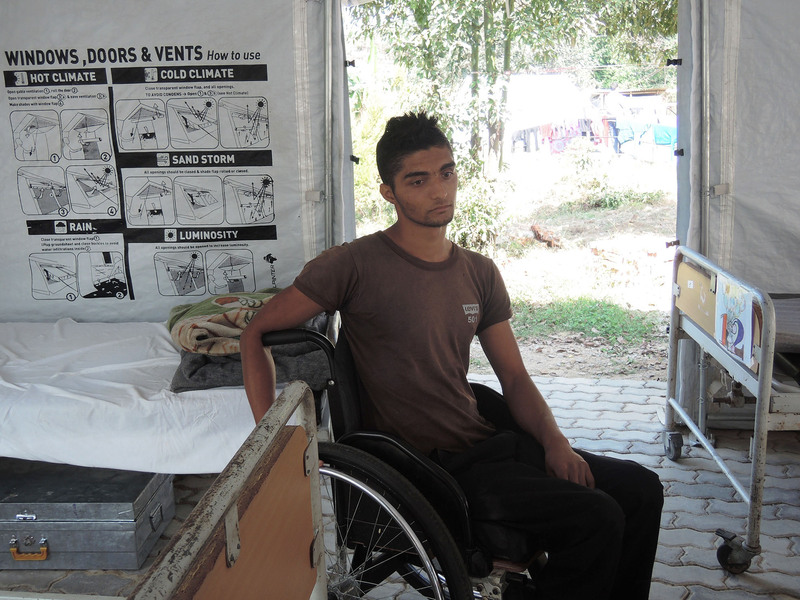 After staying in the hospital for several months, he was admitted to this MSF step-down facility, together with other patients in need of rehabilitation. I became exceptionally curious about Biraj and tried to observe him whenever he was around. While other patients were participating in group activities, he intentionally kept a distance and did not want to be involved. He was neither interested in interacting with others nor being part of a group. “He doesn’t see himself as a patient” Najma said. I started to understand what might be behind his emotionless face - he had been a passionate, energetic, creative and physically strong young man, but this could now only be proven by his wheelchair stunts, and obviously he was not proud of it, at all. I asked Najma if I could interview him. I know this can be offensive to a disabled person, especially a young one like him, with strong self-esteem, so I wanted to make sure he was comfortable about it. To my surprise, he agreed straight away. Biraj came to Kathmandu for a preparatory course for his polytechnic training in an institution. On that morning, his uncle asked him to go out for a walk, but he refused and went back to sleep. “I was sleeping when the earth shook. People started to yell and run, so did I. Suddenly I felt like a huge rock had fallen on me. I was soon buried in the debris.” People from the street arrived and rescued him, but the next tremor quickly came and he was buried again. After half an hour, he was finally out of the debris and sent to the hospital. “I don’t feel good. I have to be in wheelchair for the rest of my life. My dreams have become all dark. It’s impossible to go anywhere. I will have to start my life all over again, and will face a lot of problems.” He said, in a quiet and calm tone with that emotionless face. It seemed like he was telling someone else’s story. Suddenly I was lost for words. I began to wonder where Biraj could go after he was discharged. Nepal is not a wheelchair-friendly country, so he will not be able to move around as easily as he used to, not to mention finding a job to make a living. Thinking of how many obstacles he would have to overcome, I was overwhelmed by a sense of hopelessness. Then he said, “I have negative thoughts. But if everyone gets positive, I will get the energy to stay positive.” I was somehow comforted by his words, though at the same time frustrated by how little MSF, as an emergency medical organisation, could do for him. We provided physiotherapy, counseling and nursing care to our patients here in Sanga, but were helpless in bringing back dreams and mobility to this young man. Stepping out of the tent, Najma explained, “We are looking for a solution for him. If we push a little bit further, we may be able to help him continue his study or do what he wants to do.” I looked at Biraj, who had also come out of his tent and was playing a carom board game with other patients. In the sunlight, he was enjoying the game and smiling, just like a 19-year-old.